Addressing a gathering of RSS 'swayamsevaks' in Guwhati, days before three states of the region go to polls, the RSS chief said India will survive as long as Hinduism thrives. 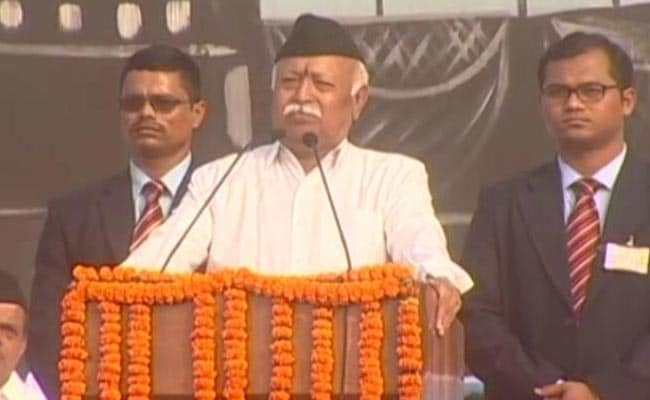 RSS chief Mohan Bhagwat said that despite its diversity, India was united because of Hindutva. Guwahati: Rashtriya Swayamsevak Sangh Chief Mohan Bhagwat today said India has forgotten all enmity against Pakistan but same is not the case with the neighbouring country. "Struggle took place. Pakistan was born. 'Bharatvarsh' forgot the enmity with Pakistan from August 15, 1947. Pakistan has not forgotten it yet. This is the difference between Hindu nature and other nature," Mr Bhagwat said at the rally. He said all ancient civilisation such as Mahenjodaro, Harappa and our culture developed in places which are now in Pakistan. "Why didn't Pakistan tell (India) to take another name since every thing of 'Bharat' has emerged from here. So we are 'Bharat' and you take any other name. "They did not say this and rather wanted to separate from the name 'Bharat'. Because they know that with the name 'Bharat', Hindutva comes in. And Hindutva is there, so is 'Bharat'," he said. The RSS chief said that despite its diversity, India was united because of Hindutva. "We have internal unity based on Hindutva and that is why India is a Hindu Rashtra," he said. Mr Bhagwat said India gives the world the message of humanity. "Others talk, but do not behave. India teaches others with its own behaviour. The world names this nature of 'Bharatvarsh' as Hindutva. That is why the people of 'Bharatvarsh' are called Hindu," he said. "If the people of India forget the Hindutva sentiment, then their relation with the country also gets snapped," he added. The RSS chief said that during the formation of Bangladesh, the country did not merge with India despite having similarities with it because of lack of Hindu sentiment. "..after partition of Pakistan, why did Bengali-speaking Bangladesh not merge with 'Bharat'? (Because) That sentiment is not there -- Hindu sentiment... If Hindu sentiment is forgotten, then 'Bharat' breaks," he said. Mr Bhagwat said India has been "struggling" for thousands of years despite its benevolent nature and now must fight to safeguard its culture and the onslaught of people "who have a tendency to attack". "But we never become enemy, even while fighting. We do not hate others," he said. Mr Bhagwat also said that gau-raksha and gau-dependent farming is the only solution to the woes of Indian farmers and appealed to people to work in this direction.